President Emmanuel Macron has angered opponents by accusing French "Gauls" of being resistant to change. On a visit to Copenhagen, Mr Macron said his attempts to remodel labour laws were impeded because the French were not as open to reform as "Lutheran" Danes. Opposition politicians accused him of showing "contempt" for his own people. Mr Macron later rowed back slightly, saying his comments were meant to be humorous. The French leader came to power on a pledge to overhaul France's enormous labour code. He has long stated his ambition to move towards a more "Nordic model". His speech in Denmark was not the first time he has used a foreign visit to highlight what he sees as the resistance to those reforms. Last year, on a visit to Romania, Mr Macron said France was "not a reformable country", adding: "Many have tried and failed, because the French hate reforms." Weeks later, speaking in Greece, the French president angered critics by saying he would not cede ground to "slackers". Mr Macron's latest comments came during a state visit to Denmark at an event attended by Queen Margrethe II. In his speech, he reiterated his admiration for the Danish "flexicurity" model, which combines a flexible labour market with generous welfare benefits. "What is possible is linked to a culture, a people marked by their own history. These Lutheran [Danish] people, who have lived through the transformations of recent years, are not exactly Gauls who are resistant to change," he said. Opposition politicians quickly seized on his speech, with many criticising his reference to "Gauls" - the name given by the Romans to those who lived in the region that now includes France, Belgium and the Netherlands. "By his words of confusing foolishness, #Macron in Denmark is not only very contemptuous against his own people, but also very ignorant about the Gauls who were formidable inventors," tweeted left-wing French MP Alexis Corbière. Drawing on the Asterix the Gaul books, leftist leader Olivier Besancenot compared the president to the unmusical village bard, Cacofonix. "We'll end up tying him to a post so he stops his scornful music," he told French TV, inspiring a string of tweets on social media. Marine Le Pen, leader of the far-right National Rally, tweeted: "As usual, he shows contempt for the French while abroad. The 'Gauls' will be happy to respond to his arrogance and contempt." Republican MP Fabien Di Filippo said the president had made "a new insult to the French people", adding: "Emmanuel Macron has outdone himself in Denmark." Amid a torrent of criticism on social media, Mr Macron sought to clarify his remarks on Thursday, saying they were "humorous". "I love France and the French and I love in all its components. I love them, these Gallic tribes, I like what we are," he said during a visit to the Finnish capital, Helsinki. A government spokesman said Mr Macron had been referring to political parties when he spoke of resistant Gauls. Mr Macron took office in May last year, still a political novice - never previously elected and little versed in the cut-and-thrust of French politics. 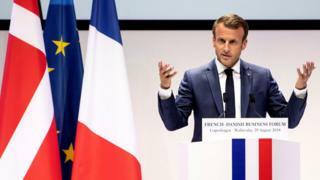 His government promised to cut unemployment from 9.5% to 7% in five years, but Mr Macron admitted that he expected months of resistance to some of the proposed new employment laws. In September last year, union-organised protests took place in cities across France against proposed changes to labour laws. Many placards reflected Mr Macron's remarks about French workers, with messages such as "too lazy to think up a slogan" and "slackers on the move", which mocked the name of the president's centrist LREM party (Republic on the Move).